I’ve always known that dog eyesight is different from human eyesight. Specifically, dogs see color differently than we humans do. In the past, I’ve wondered why some of the toys that I bought for my dogs didn’t seem to be enjoyed by them. This is kind of important… because most of us buy a lot of dog toys for our four-legged friends. We want to find the best dog toys that they will spend the most time playing with — right? 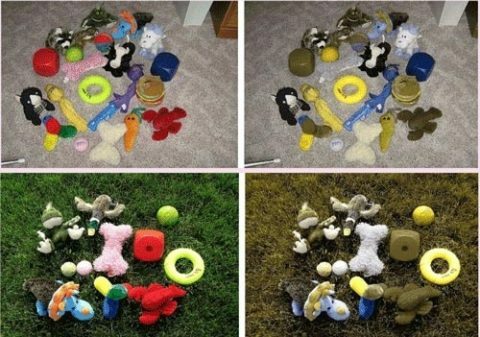 Well, it turns out that our dogs’ favorite toys may have something to do with their color! 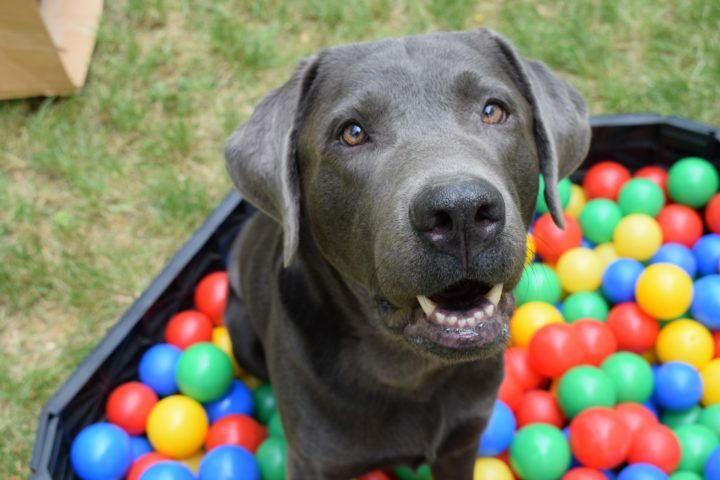 Basically, dogs are not not actually colorblind — dogs see color. However, dogs see all colors of the rainbow as shades of blue or yellow — as seen in the 2 photos below. So… when it comes to buying dog toys, there are certain colors of dog toys that your dog will see (and probably like) better, and certain colors of dog toys that your dog will have a harder time seeing (and probably play with less). Since dogs see some colors better than others, with our new 3-month-old puppies, I’ve (mostly) made a point of buying toys in colors that dogs can see best. In the eyes of your canine friend, dog toy color matters — especially when the toy is on a backdrop of gray or brown, as seen in these photos. TIP: The easiest way that I remember the best color for dog toys and which colors to avoid is by singing (to myself) the Rainbow Song each time before I buy a new dog toy. The first 3 colors mentioned are NOT dog-friendly colors, while the last 3 colors in the song ARE dog-friendly colors! Here are the best selling dog toys on Amazon. I’ve purchased many of them — choosing the blue or yellow version whenever possible, since those are the best color for dog toys.